Starbucks' Grande Wednesdays Promo is back! Enjoy their special customized Frappuccino blended beverages for only ₱100 for a Grande (16oz.) 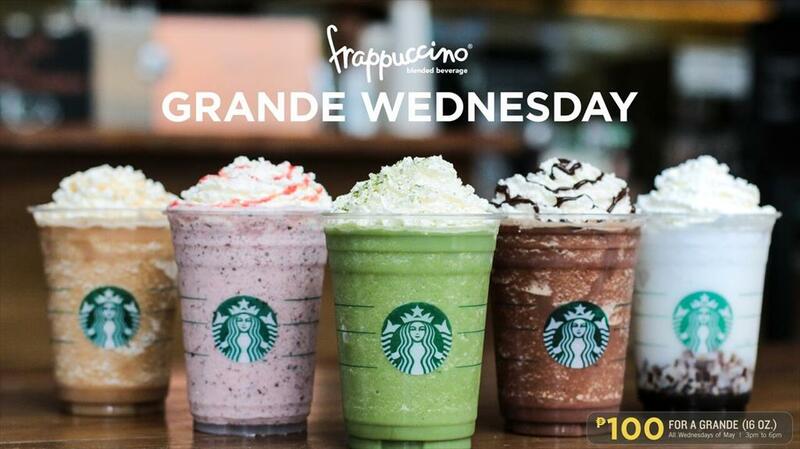 size all Wednesdays of May, from 3pm to 6pm in all Starbucks branches nationwide! Offer is limited up to two (2) purchased featured Frappuccino® blended beverages per customer per transaction. No “ADD ON” allowed except for soy milk for customers with health concerns. This promo cannot be combined with other offers or promotions (including our cup discount). In the purchase of goods and services which are on promotional discount, the senior citizen/PWD can avail of the promotional discount or senior citizen/PWD discount, whichever is higher. VAT Exempt discount is not allowed. Purchased featured Frappuccino® blended beverage (at ₱100 for a Grande) will NOT earn a Beverage Star if paid using a Starbucks Card. Featured Frappuccino® blended beverage (at ₱100 for a Grande) are NOT ELIGIBLE as purchased beverage to redeem a complimentary birthday cake, Beverage Star Reward or Registration Treat. 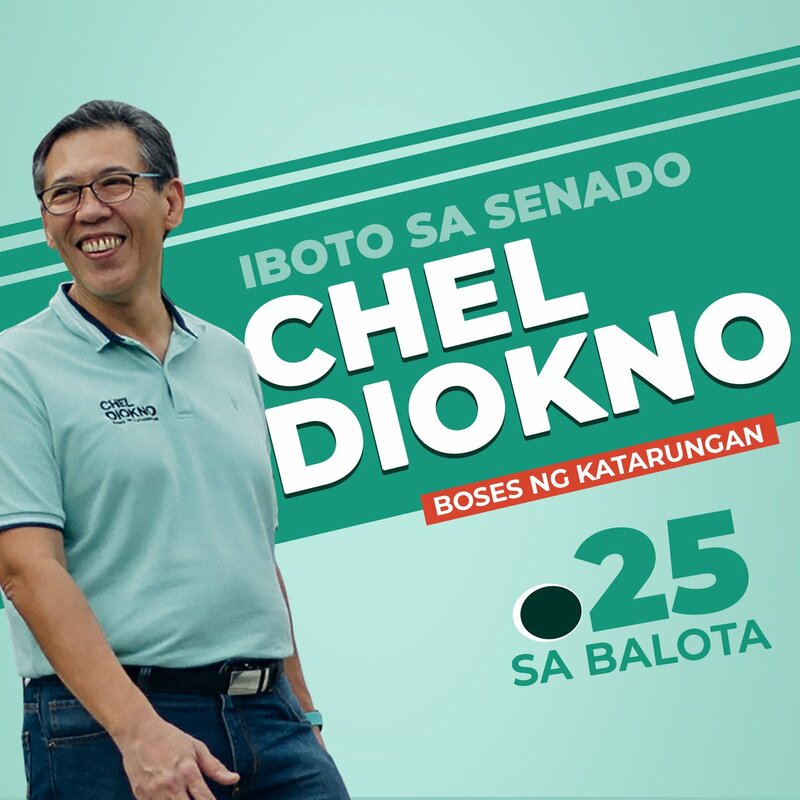 Offer is valid in all Starbucks stores in the Philippines including Drive Thru window. 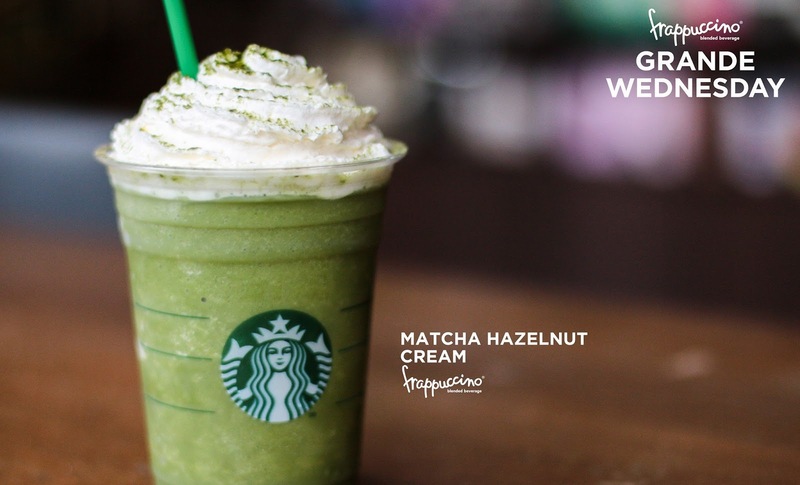 Featured Beverage on May 2, 2018 - MATCHA HAZELNUT CREAM FRAPPUCCINO® BLENDED BEVERAGE. Your favorite Green Tea Frappuccino® is infused with sweet and buttery Hazelnut syrup to create a popular combination of flavors! Whipped cream and a dash of matcha powder complete this drink. 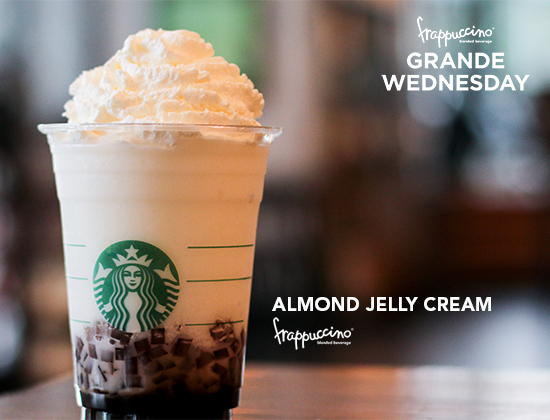 Featured Beverage on May 9, 2018 - ALMOND JELLY CREAM FRAPPUCCINO® BLENDED BEVERAGE. Aromatic Almond syrup blended with milk and over our signature coffee jelly cubes make a light and refreshing Frappuccino® drink. This beverage is finished with whipped cream for just the right amount of creaminess. 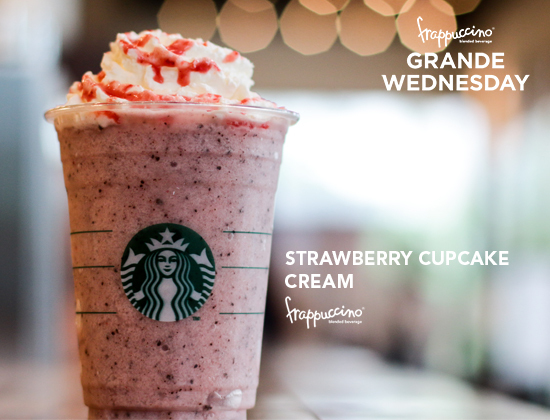 Featured Beverage on May 16, 2018 - STRAWBERRY CUPCAKE CREAM FRAPPUCCINO® BLENDED BEVERAGE. Frappuccino® chips dense with chocolate and coffee taste are blended into Vanilla Frappuccino® then mixed with sweet-tangy strawberry sauce for the perfect pink indulgent beverage! Toppings of whipped cream and strawberry sauce make this an Instagram-ready drink. 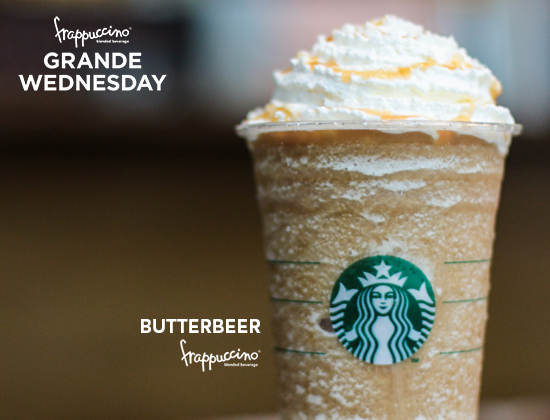 Featured Beverage on May 23, 2018 - BUTTERBEER FRAPPUCCINO® BLENDED BEVERAGE. Caramel lovers, rejoice! Caramel and Toffee Nut syrup blended into coffee Frappuccino® make a delectable concoction. Buttery-sweet caramel drizzle toppings contrast beautifully with the vanilla notes of regular whipped cream. Featured Beverage on May 30, 2018. 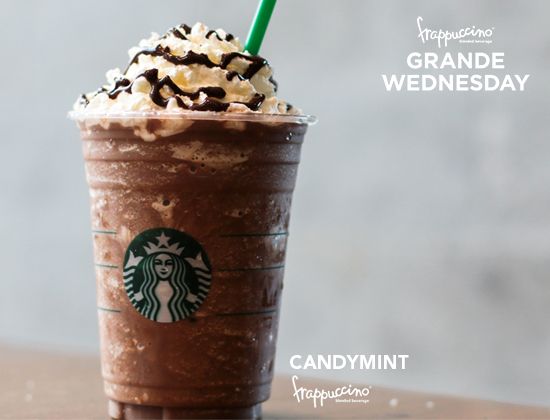 CANDYMINT FRAPPUCCINO® BLENDED BEVERAGE. You can’t go wrong with chocolate, mint and coffee. Our classic Mocha Frappuccino® with extra chocolate flavor is infused with mint syrup for a splash of cool complementing the intense coffee notes of this drink. Chocolate drizzle over regular whipped cream lend more chocolaty goodness to this beverage.